The 2017 IDP Roadshows kicked off on Tuesday 18 April with meetings at Dikidikana Community Hall, Dubu Community Hall, Quzini Community Hall, Mzintshane Community Hall and Berlin Hall. 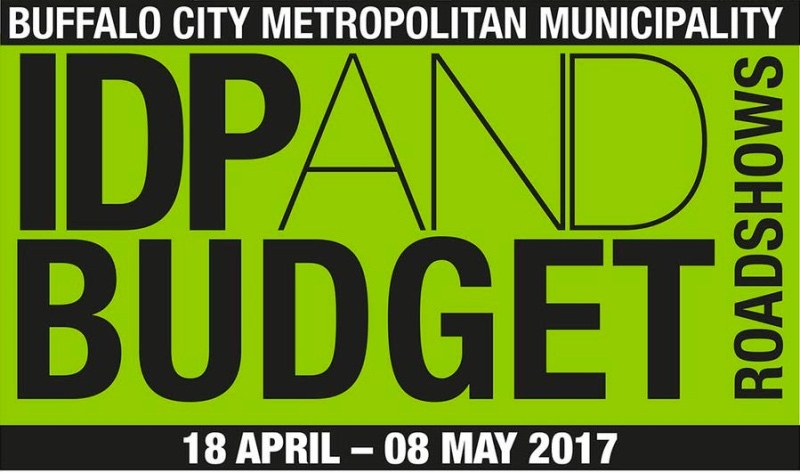 The roadshows are set by the metro for communities give share their views on the 2017/18 financial year budget and planning. Below is the list of priorities raised by community members in each of the following wards. Ward 35 met at Quzini Hall with the following priorities raised. In Balasi Valley requested the clearing of bushes, fencing around the dam in Balasi Valley where a young boy recently drowned, the upgrading of sports facilities around the ward, the construction of roads across the ward, the community requested for land to use as a graveyard and a request for toilets was made. Ward 36 residents gathered at Mzintshane Community Hall raised issues ranging from the building of RDP Houses, a community hall has been requested for an upgrade, the electrification of houses in the Ward and construction of ablution facilities including the revitalisation of the factories in a bid to create employment in the ward and a request for speed humps in a nearby school for children cross the main road and high mast lights have been requested as well as the fixing of streetlights. Ward 38 had their meeting at the Dikidikana Community Hall with over 100 residents attending and raising issues including electrification of houses, construction of destitute housing units, ablution facilities in Lieveldt, Mamata and Mxaxo, water outages to be looked into, installation of taps, roads to be re-graveled and youth programmes to be a priority. Dubu Community Hall was filled up with residents from Ward 40, with the purpose of sharing their views and also give the municipal officials guidance on which areas needs to be improved in their area. Areas of improvement and in Ward 40 include the building of a community Hall in Qongqotha, a request to enforce by-laws on those who own shebeens about the opening and closing times of business, the fencing of cemeteries that are being damaged by livestock, housing rectification and construction of better ablution facilities. Another concern in the area includes a bridge that needs to be constructed in the Fordmarie are and streetlights. Ward 45 met in Berlin Hall with residents requesting for high mast lights, land, new houses for the wooden houses beneficiaries and the upgrading of stormwater drainages. The IDP Meetings for this week will continues as follows: on Thursday 20 April Ward 41 will meets at Nolizwe Mnyaka Community Hall, at 5pm, Ward 37 the meeting will be at Schornville Hall at 5pm, while Ward 39 will hold their meeting at Weir Hall at 5pm and Ward 44 meets at Sweetwaters Hall at 5pm at Sweetwaters Community Hall. There will be an open council day held 16 May and the adoption of the final IDP and Budget will take place on Wednesday 31 May. The Executive Mayor Councilor Xola Pakati will deliver the State of the Metro Address, 22 June.